Our guests enjoy a variety activities while visiting Humpy Cove and staying at Orca Island Cabins. We enjoy sharing their experiences with other guests and on our social media platforms. The adventures they have create stories that are passed on through friends and family and in bring new visitors to us as well as returning ones. We are forever grateful for these conversations and feel a sense of gratitude that our property continues inspire. 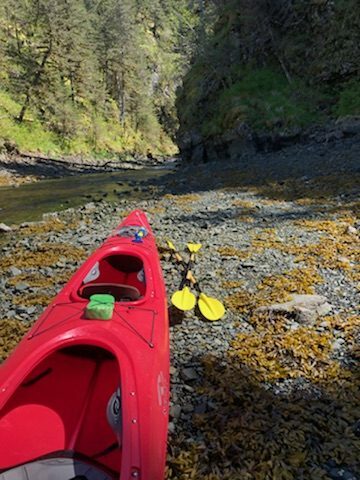 During their stay guests have enjoyed kayaking to a hidden waterfall, stand up paddleboarding in calm protected waters, and even catching a rockfish or two right from our dock or in a rowboat. Additionally we have discovered a hiking trail and have been maintaining these as part of the activities guests can pursue. The trail is actually an old military jeep trail, which is assessable by watercraft. A short paddle across the cove from or dock leads to the trailhead. Guests have to navigate switchbacks and some avalanche shoots that are not easy for everyone. Once they are able to make it to the reward is a breath taking view of the bay and the chance to explore an abandoned military bunker from WWII. If there wasn’t already enough to talk about at the evening campfire! Come explore Humpy Cove and stay in a Yurt. We hope to be part of your story.